PYONGYANG, Korea, Democratic People's Republic Of -- South Korean President Moon Jae-in began his second day of talks with North Korean leader Kim Jong Un on Wednesday, with the leaders planning to release a joint statement that many are hoping will keep alive tentative nuclear diplomacy between Pyongyang and Washington. The North also will likely stage for Moon a huge mass games spectacle to show off its national pride. Kim and Moon were smiling and chatting as they walked down a hallway and into a meeting room at the guesthouse where Moon is staying. Kim's sister and North Korea's top propaganda official, Kim Yo Jong, were in attendance. Many of Wednesday's details were unclear, but North Korea was expected to hold a huge mass games spectacle later in the day, with Moon attending an event expected to draw about 150,000 spectators, Seoul said. It wasn't clear if Kim would attend. North Korea first staged its mass games in 2002, when Kim's father, Kim Jong Il, was leader. They continued most every year until 2014, then were revived during North Korea's celebrations of the 70th anniversary of its state founding earlier this month. Kim gave the South Korean president an exceedingly warm welcome on Tuesday, the first day of the summit, meeting him and his wife at Pyongyang's airport -- itself a very unusual gesture -- then riding into town with Moon in an open limousine through streets lined with crowds of North Koreans, who cheered and waved the flag of their country and a blue-and-white flag that symbolizes Korean unity. The summit talks began at the ruling Workers' Party headquarters where Kim and Moon were joined by two of their top deputies -- spy chief Suh Hoon and presidential security director Chung Eui-yong for Moon, and for Kim, his sister, Kim Yo Jong, and senior Workers' Party official Kim Yong Chol, according to Moon's office. At the start of their meeting, Kim thanked Moon for brokering a June summit with President Donald Trump. 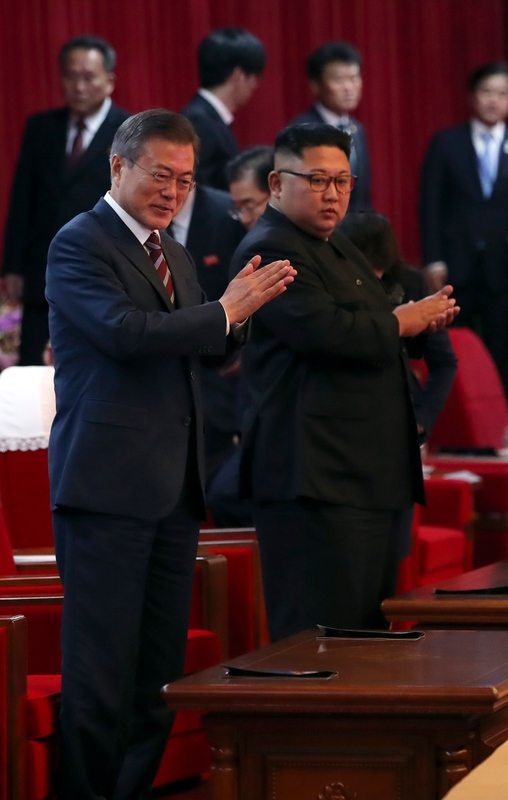 Even though tens of thousands of people had witnessed Moon's drive into the city with Kim, the arrival was not broadcast or even mentioned on the evening and night news on North Korea's central television network. The North often delays reports while it takes time to review and edit for maximum propaganda impact. 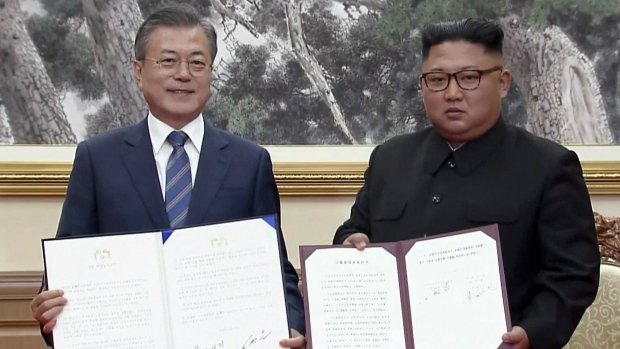 Seoul officials have said the talks would focus on how to achieve denuclearization of the Korean Peninsula, decrease military tensions along their border and improve overall ties. The North's media said the talks would reaffirm their commitment to Korean peace, unity and prosperity. Speaking at the guesthouse, Kim said North Koreans hope diplomacy will yield positive results. "I think it was our people's wish that we come up with good results as fast as we can," Kim said, according to the media pool reports. More than in their previous encounters, when the mere fact of meeting and talking was seen as major progress, Moon is under pressure to leave Thursday with some concrete accomplishments. One of Moon's objectives -- and one that also interests Kim -- was clear from his entourage. Traveling with Moon from Seoul were Samsung scion Lee Jae-yong and other business leaders, underscoring Moon's hopes to expand cross-border business projects. All major joint projects between the Koreas are stalled because of U.S.-led sanctions. But the nuclear issue was sure to cast a shadow over negotiations on economic ventures and other joint projects. Moon before his trip began vowed to push for "irreversible, permanent peace" and for better dialogue between Pyongyang and Washington. But as he arrived, the North's main newspaper made his work all the more delicate, blaming the United States alone for the lack of progress in denuclearization talks. Kim's strategy has been to try to elbow the U.S. away from Seoul so the two Koreas can decide for themselves how to bring peace and stability to their peninsula. North Korea maintains it has developed its nuclear weapons enough it can now defend itself against a potential U.S. attack, and can now shift its focus to economic development and improved ties with the South. Talks between the United States and North Korea have stalled since Kim's meeting with Trump in Singapore in June. For Kim, the timing of this week's summit is good. North Korea just completed an elaborate celebration replete with a military parade and huge rallies across the country to mark its 70th anniversary. China, signalling its support for Kim's recent diplomatic moves, sent its third-highest party official to those festivities. That's important because China is the North's biggest economic partner and is an important political counterbalance to the United States. Kim reported from Seoul. AP writers Hyung-jin Kim and Foster Klug contributed from Seoul.